This is the perfect guide for patients with new dentures. Shows both conventional and implant-supported dentures with illustrations and gives tips for getting used to dentures. 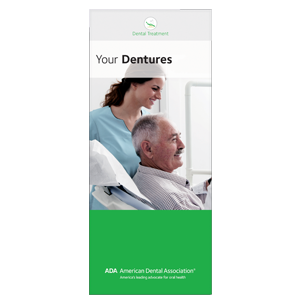 Includes pointers for denture cleansing, plus details about adhesives, adjustments and when to reline or replace dentures. Reminds patients to continue daily hygiene and regular dental visits. Pack of 50, 8 panels.